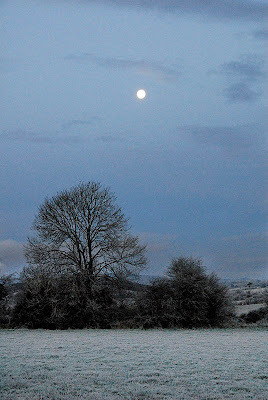 Well it might not have snowed, but as Christmas Day was breaking in Killaraght, a crisp frost covered everything and the moon still hung in the sky. 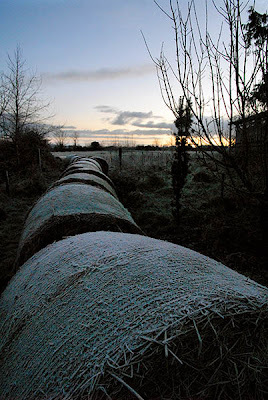 Happy Christmas one and all. Oh no...it's just too beautiful. You know how I weep at beautiful! I'm calling my hubby into my office as I speak. Thank you for your lovely comment on my blog. I'm attempting to respond to it today. I've had so much on my plate I'm falling behind. Forgive me. 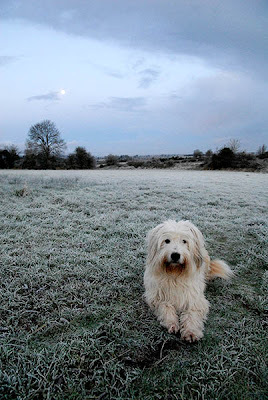 One observation...do you think your dog is cold laying on the frosty ground?! I always look at life from an animals perspective. Why? I have no clue! Merry Christmas to you, your family and your beautiful animal menagerie!